Next, we headed to the Grand View Point Overlook, the southernmost viewpoint in the Island in the Sky District. 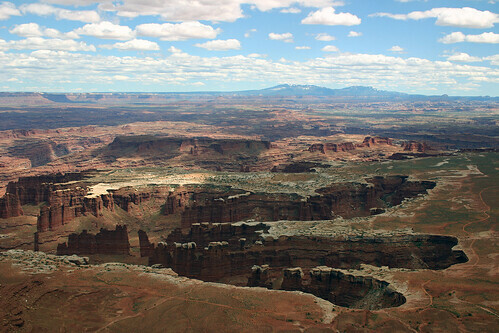 In this photograph the White Rim Road is visible. It is an unpaved road which gives visitors to the park access to the lower canyon rim. Unfortunately, we did not have time to spend driving the road, so we had to settle for this spectacular view. From this vantage point the Green and Colorado Rivers were not visible. The rivers have cut deeper, narrower channels in the broad canyons we saw. Somewhere below us the Green River joined the Colorado on its journey south. This entry was posted on May 2, 2008 at 9:19 pm and filed under Canyonlands, Canyonlands National Park, canyons, Colorado River, Grand View Point, Green River, Moab, National Park, Utah, vacation.